Anyone Know Who Makes This Stool? I have been looking for counter stools for our kitchen and haven't been able to find ones that I like -- my wife and I are very picky. I have a design that I may go with, however, while I was watching the Live Earth Concert on the Bravo channel I caught the end of the American Express Card Member Project commercial. I think that stool at the end of the commerical might be the one for us... not 100% sure about the wood top, but I'd love to know who makes it. 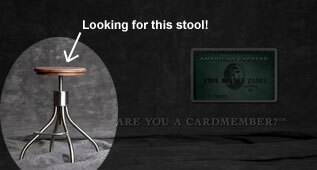 So, if you have seen this stool before and know who makes it or where to buy them please post a comment... Thanks! If you were the ones that emailed thanking me for the post about BioRings, well here is yet another one you'll love! It's art, made to represent what you are made up of... deep huh!? Yeah, so when people ask you, "Who Are You!? ", after you say something they didn't quite understand, you can just point to your wall and say, "That!". The company that creates this unique art is called DNA 11. The process is quite simple, you order a print, they send you a DNA collection kit. Spit into the plastic pill case looking thingy and send it to their lab. The lab then processes your DNA and sends DNA 11 an image that they use to create your wall art. The art is printed using advanced Giclee printing technique on canvas. For those of you that never heard of Giclee printing... click here and here for more details. The prices range from $390 for a single 18"x24" print to $940 for a 36"x54" splitscreen (pictured)... so you and your significant other can see where each others genes went wrong.